A fun and educational new app has just been released for kids who want to become archaeologists! The new device turns the archaeological excavation experience into a fun and informative adventure. 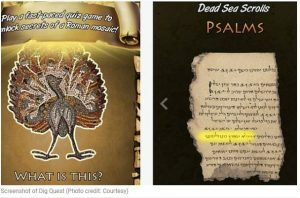 Kids can ‘dig’ for artifacts, piece together ancient scrolls or unearthed objects, and even go on a ‘virtual hunt’ for Israel’s many hidden treasures. The app that was actually created by the state of Israel’s Archaeological Authority is available on both IOS (iPad and iPhone) and Android. Aside from the Dead Sea Scrolls, the app also introduces some lesser known historical treasures – the Lod Mosaic, a Roman mosaic that was discovered in Lod during highway construction in 1996. The mosaic, measuring 50 by 27 feet, is one of the best-preserved mosaics ever found in Israel and was fully unearthed only in 2009. It has since been displayed in museums such as New York’s Metropolitan Museum of Art, the Louvre, the Field Museum in Chicago and Berlin’s Altes Museum. The app features a game in which players identify various figures and drawings on the mosaic – with the challenges getting more difficult as the levels progress.